In a fashion battle between Taylor Swift and Michelle Obama, one would assume the bright, sparkly uber-celebrity would take the cake. Sure, the first lady is one of the most fashionable women to ever occupy the White House. But she's also, like, a mom. But against all odds, FLOTUS blew T-Swift out of the water -- er, slime -- at Nickelodeon's Kids' Choice Awards on Saturday night. 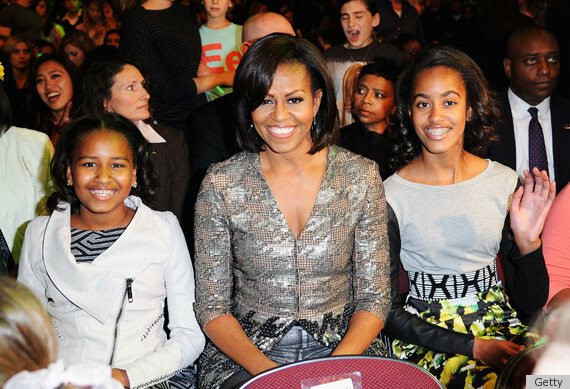 Michelle was on hand with Sasha and Malia to award Swift Nickelodeon's Big Help Award, recognizing her charitable work. "Taylor Swift may be in the news," said Mrs. Obama from the stage, "for the award-winning songs and multiplatinum records, but every step of the way she has always made it a point to give back. She's supported children's charities, she's worked to combat bullying, and given over tens of thousands of books to schools and libraries all around the country." But despite Taylor's own superstardom, the pop singer was starstruck when she took the stage with Michelle. "I've always wanted to meet you! This is amazing. I'm so honored to get... to be receiving this award from the First Lady of the United States -- I'm freaking out." So were we, considering how good the first lady looked! No pantsuits or broaches here -- for an event that included pop music, green slime and guests like Katy Perry, Justin Bieber and Selena Gomez, the first lady chose a youthful outfit: metallic skinny jeans by Helmut Lang, a sequined v-neck top by Wes Gordon and black pointy-toes pumps. To be honest, we'd sooner expect to see T-Swift in such an ensemble than the first lady. But when it comes to fashion, Michelle Obama is always full of surprises. See our stylish first lady below. Did Michelle outshine Taylor? See what else FLOTUS has worn this year in our Michelle Obama Fashion Vault!